But not in a “Survivor” way. They’re actually going to get this boot. Kathy helped pick out this … this … Wow. I didn’t know what to say when I first saw it. I mean…it’s got barb wire! Her dad actually said, “I could have made that for you.”, which only furthered the experience. 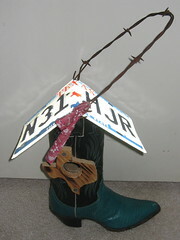 It’s a Birdhouse, it’s got barb wire, and a license plate on a turquoise Boot. Dood. Also in Tommy House news, Mike proposed to his hunny. And she said yes. Go them! Mike, there’s a cat in the garage. Don’t run over it. While on a complete high from watching Doom in all of it’s B-movie goodness, there was a freezing, yet friendly cat outside the house. 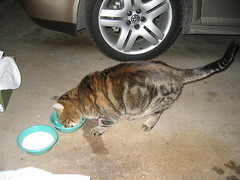 It was cold, and I had some leftover tuna from a previous roommate. Worked out nicely. Coincidentally, if there is such a thing, I was thinking about getting a pet. But not this one as it disappeared after we gave it a gap in the garage door. It’s amazing how you’ll talk to an animal, even though you know it’s not listening. –Snoopykiss just leveled up his Karma.